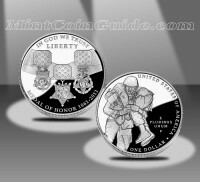 One of the several commemorative coins scheduled to be issued by the US Mint in 2011 is the 2011 Medal of Honor Commemorative Proof Silver Dollar. Struck to recognize and celebrate the Medal of Honor and its recipients, the coin will be minted from 90% silver. The Medal itself was established back in 1861 by Congress and has been given to less than 3,500 individuals since then. In order to receive a Medal of Honor, a member of the United States Armed Forces must distinguish themselves at great personal risk above the call of duty while engaged in operations against belligerent forces. Surcharges raised by the sale of each coin will be forwarded to the Congressional Medal of Honor Foundation to further the goals of the organization. Struck from 90% silver, each Medal of Honor Silver Dollar will have a diameter of 1.5 inches. The US Mint released the Medal of Honor Coins on February 25, 2011. An introductory price of $54.95 was charged by the US Mint with the standard price of $59.95 taking effect on March 28, 2011, at 5:00 p.m. ET. The US Mint’s facility in Philadelphia struck the Medal of Honor Proof Silver Dollars. "be emblematic of the traditions, legacy, and heritage of the Medal of Honor, and the distinguished service of its recipients in the Nation’s history." "contain motifs that represent the 3 Medal of Honor designs (Army, Navy, and Air Force) and specifically honor the Medal of Honor recipients of both today and yesterday, such designs to be consistent with the traditions and heritage of the United States Armed Services, the mission and goals of the Congressional Medal of Honor Society, and the mission and goals of the Congressional Medal of Honor Foundation." For the obverse, Jim Licaretz created a design showcasing the three current Army, Navy and Air Force Medals of Honor. The reverse shows a US Army infantry soldier carrying a wounded soldier to safety while under enemy fire. It was designed by Richard Masters and sculpted by Phebe Hemphill.